Prelude idle video...messed up pls help!! Re: Prelude idle video...messed up pls help!! Mine does this too, but dies every once in while as well. I have to tighten up the idle screw below the TB every few weeks. I'm sure there is a proper way to fix this though. 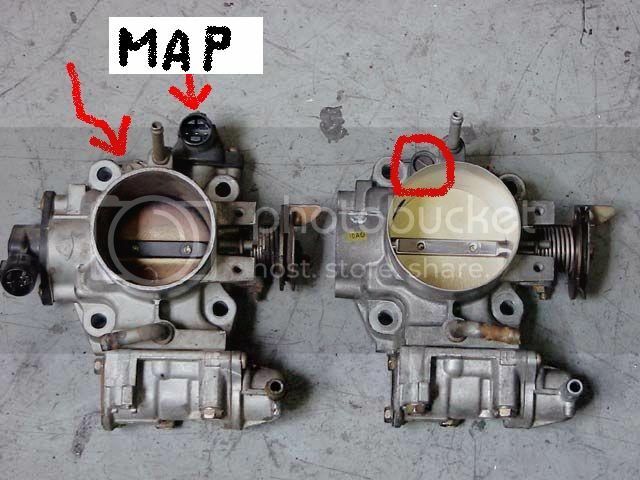 kinda to the lower left of the MAP on the throttle body. i have mine set around 850 rpms. you can put a dab of honda bond on it so it wont move. that isnt your issue though. have you cleaned your IACV? Done anything to anything with a vac line on it? Messed with anything coolant related? Last edited by biglegs; 02-14-2011 at 04:29 PM. Mine does the same thing.. It dies a lot in traffic lol. I was stopping at a stop light and my baby turned off lol then I started it again while it was rolling. Now that its getting warmer, it doesn't do it as often. that would be your powersteering. I know it's the power steering I've never had it raise my RPMs lower yes never raise. the throttle cable feels playfull....is that normal? Yes, you should have a little slack.